Best Organizing Tools That Actually WORK! When it comes to organizing having the best organizing tools can make the job a lot easier to do. Corraling small items, bunching together like items, and turning an awkward section into an efficient storage area are all great reasons to utilize these tools. These are my top picks for organizers for the home that work! Unfortunately, some of the baskets, totes, and boxes can be pretty pricey and that is where I come in. This is a compilation of my favorite products that you can use as your new home organizers. Set your cluttered rooms up into organized havens that you will love! Best Organizing Tools For The Home That Work! Some of my favorite organizers are the simplest ones. I love big baskets and bins. They are so versatile and can hold so much and will work in just about any room in the home. Another favorite of mine is the clothes basket. This is by far my number one organizing tool of choice. I like to take it into a room that needs cleaning and fill it up with any items that belong in another room. It holds so much and it is very easy to carry around the house. I can easily walk around my home, gather up things that are out of place, and put them away on in one trip. 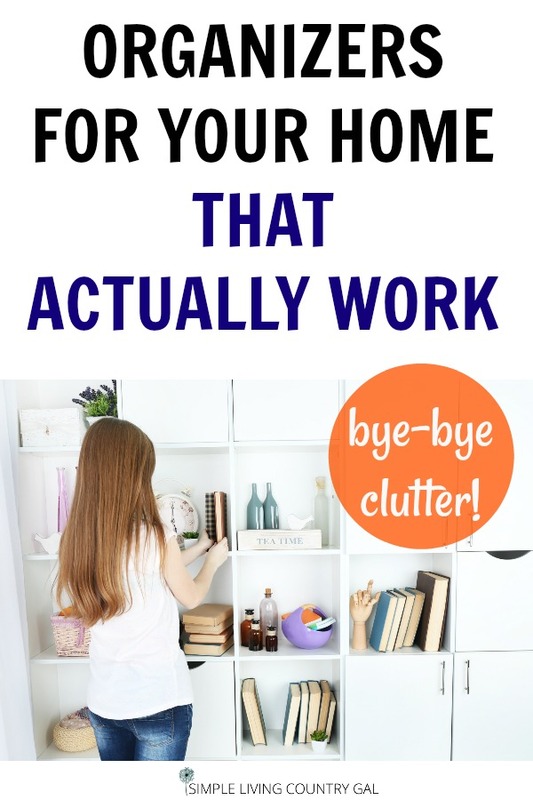 It is a very simple way to do a fast declutter in your home. That is basically what organizing is all about. Making what you have on hand work specifically for you! When it comes to organizing drawers, utilizing the space you have to hold all the things inside without it becoming a jumbled mess is key. I find a few simple baskets work the best and can corral small items making it so easy to find just what you are looking for. Whether this is a drawer in your kitchen or a dresser drawer in your bedroom, having things sectioned off will help you to keep your items neat and tidy. With these tray organizers, even your junk drawer will be organized! 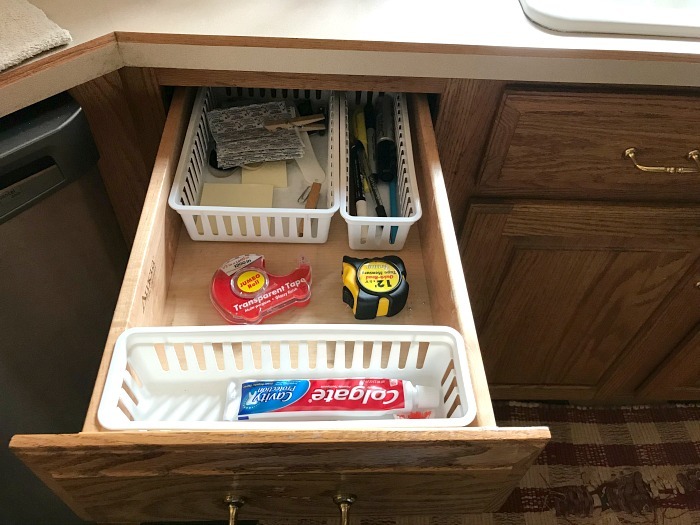 Most folks might not think that organizers are needed inside your cabinets, but if you are limited on space a few good tools can give you a bit extra where you really need it. From vertical storage to additional corner shelving corner shelving I have found all of these tools quite helpful when it comes to my kitchen. No matter how much room we have in our closets there never seems to be enough. Luckily there are some great organizers out there to create space where we need it and in turn, double the size of what we have. READ: GRADUAL DECLUTTERING – REMOVE THE MESS ON ANY SCHEDULE! Since we have pocket doors on our closet we miss out on some of those door hanging organizers out there. Oh, how I wish I had a traditional closet door, all that extra space! I love to also think outside of the box for extra organizing ideas. 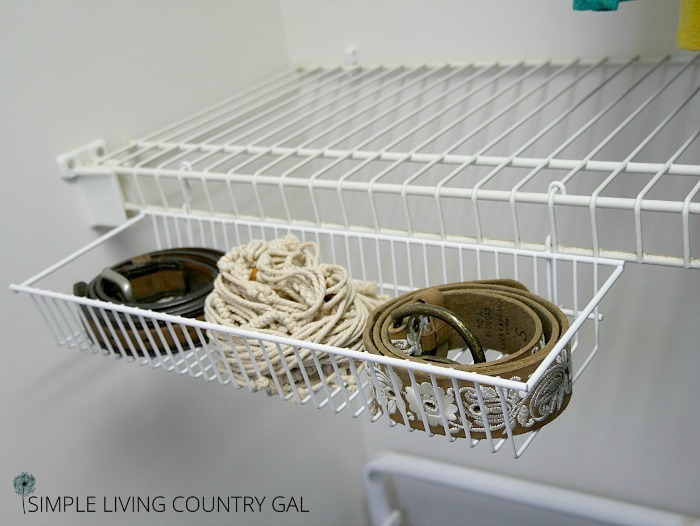 Use a hanging shelf to corral belts leftover from another project for example. Don’t forget to take these tools one step further and do a good purge of your clothes. Read my How To Declutter Your Closet post with some of the best and simple tips from all over the internet! There is nothing more frustrating than trying to organize a spot that is invaded by pipes and drains. These tools will help you to make the most out of these areas so you can keep even the quirkiest spots organized. Flexible totes will fit nicely under the kitchen since where those pipes take up most of the available room. With handles, they are easy to move in and out and can be bent or even folded a bit to fit snugly inside. Over the door bins also work well here. Use them to hold plastic bags, trash, or recyclables. Use these same solutions in the bathroom. Rather than storing bags you can store washcloths and free up space for other things. Use the door organizers to hold lotions and sprays. The baskets can hold cleaning supplies or extra toiletries or toilet paper. Sometimes you need to think outside of the box and learn to make the most of any area where you just might find valuable space in the most unlikely places. 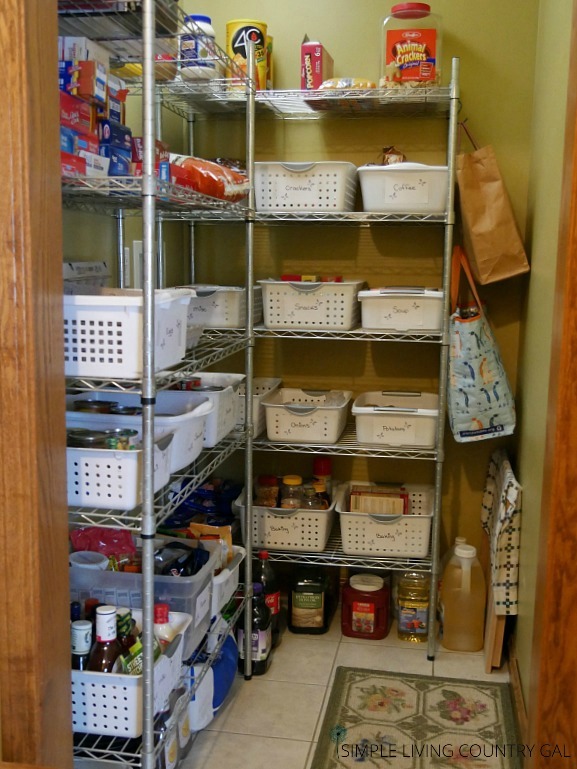 I love my pantry and find it to be pretty easily organized with just a few baskets and bins. These are a few of my favorites and are quite affordable. I love these baskets so much I use them in my closet, office, kitchen, and even my bathroom to corral items easily. By keeping like items together in an opened basket you will make it so much easier to keep a newly decluttered area neat and tidy. Still tight on space? Then door organizers will free up even more. Use them to hold seasoning packets, meal kits, rice, and noodles. They work amazingly well and come in all different sizes. The trick is to label things clearly so your family will help you keep things where they need to be. Another plus to organizing this way is you will easily know when you are running low on items so you can put them on your shopping list. Another spot that demands organizers is in the closet. 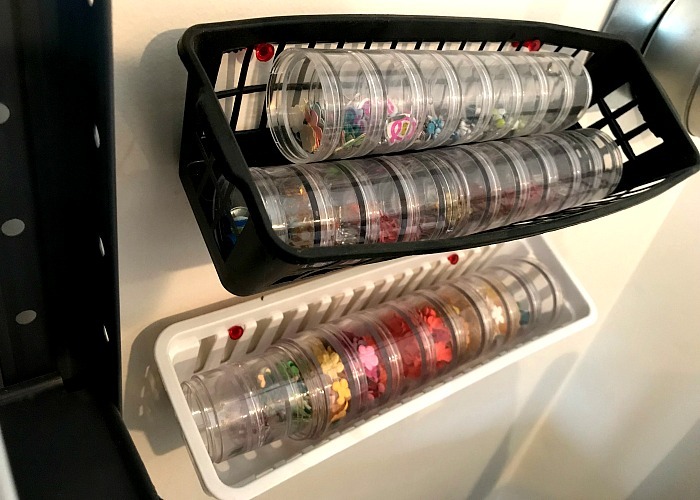 Whether it be the master or the closet in your child’s room, using organizers such as these will again keep items corraled and so much easier to keep tidy. Use hanging organizers to prefill with daily clothing options for young children. Allowing them to do more will not only teach independence but it will free up time for you in your already busy schedule. Not enough shoes to justify a hanging shoe organizer? Use it instead for shoes at the top and toys at the bottom. Teaching your children to organize their favorite toys will also teach them to treat what they value with respect. I love to have an organized, decluttered and always tidy room. I feel that we work so hard during the day that we deserve a spot that is always neat and peaceful. If you want to ensure you get a goods night sleep, first declutter and organize your bedroom. If you fall asleep amidst chaos you will not sleep well. 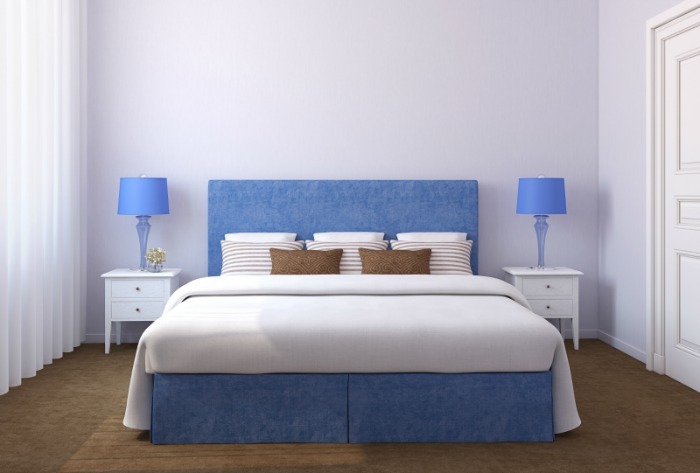 Set your bedroom up to promote a peaceful sleep and you will have more energy to tackle your days. Plastic totes will hold off-season clothing and store nicely beneath your bed. A large basket will hold bedding as you remove from your bed each night for sleeping along with an extra blanket for those chilly nights. Dresser top organizers will work wonders to keep your dressers neat and cleared off. Designate a spot for specific items and the rest will need to find another home. I love to craft and you might love to as well so that is why I added in this area on my top organizer’s list. This room is notorious for having many MANY items of all shapes and sizes. None of us crafters want to spend any time at all looking for supplies so organizing this area is the key to an enjoyable room. I love these see-through bins to help me see just what is inside. Lazy susans for markers are perfect to hold glue and scissors as well. You can find even more of my (dirt cheap) organizing hacks in my popular post. READ: Organizing Your Craft Room On The Cheap. You don’t always need to purchase fancy organizing items in this room. You will be amazed at what you can use that you just might already own. Don’t have a craft room? These tips will work in a child’s playroom or your husband’s workshop too! Remember, clutter is simply items that most often do not have a home. By using baskets, bins, and totes you will have not only a home for the things you use but a simple way for anyone in the family to clean up. 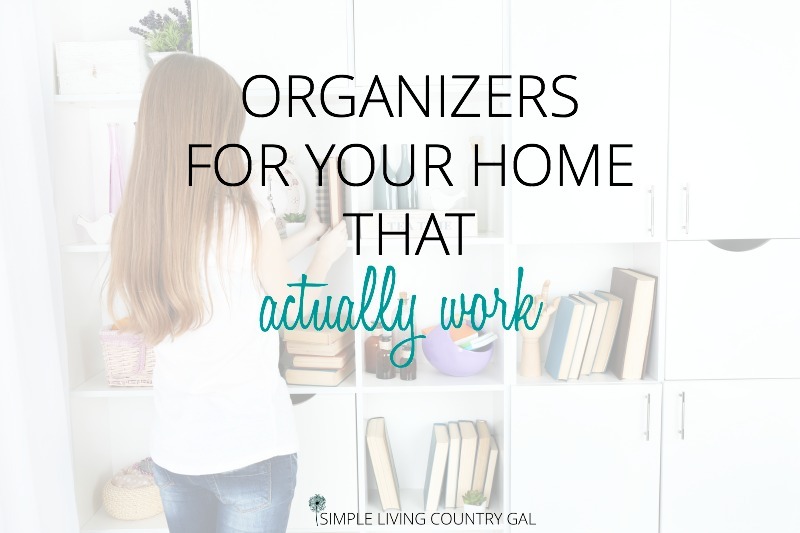 Follow this list of the best organizers for the home that work for inspiration to stop the clutter in your own home! What are your favorite and best organizing tools for the home that works for you? This is a nice article. It would have been made better by having links or at least photos of the different types of baskets and bins and other organizers that you like. Basically, it’s just common sense. 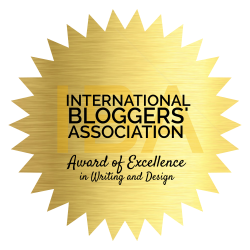 I thought, because of the title, it would contain links to organizers that have worked for you. Just a suggestion. I do appreciate all of the decluttering ideas and helpful hints to get it done, especially since I’m definitely a packrat! I’m using some of your great ideas just now in helping me get ready for a visit from relatives!!! I am so happy you commented! I realized with all the ads in that article you were unable to see all the photos I had of my favorite organizing tools! I have oodles of pictures in there but now they are so much easier to see. Thanks for this post, Tracy! You shared some great ideas for organizers and links for how to get them on Amazon. What you said about using what we already have on hand is a great point, too. Cute little jars from a certain kind of jelly we always buy work great for storing some of my craft and office supplies, and because they are all the same kind of jar, once I hot glue a narrow ribbon around the top where the threads of the jar are they actually make the shelves look pretty and uniform and well organized. Thanks again for sharing some ways to help keep the clutter under control! I just love to use jars to store our staples but never used them for office supplies. What a genius idea! I am definitely going to give that a try. Thanks for sharing!